Can physical design underwrite stewardship? This project was undertaken to ask if users can become stewards through the design of a space and the objects in it. A shared kitchen became my medium. Housed within a graduate studio building, the kitchen serves a variety of stakeholders, primarily current students, faculty and fellows of the MFA program. While it is the practical hub in the domestic life of the studio building, it is also the cultural hub - the kitchen is the only place with the capacity to host socializing. Short term, I set out to make the space more functional and more inviting. Longer term, the goal was to create a space, and systems of use that prompted rotating generations of users to maintain the space as if it was their own. As this was my MFA thesis, I conducted the research, prototyped possible solutions, designed the remodel and carried out the changes. The result was increased use of the space, increased community cohesion and continued stewardship. The kitchen was underused, under-maintained and generally unable to serve stakeholders in the way it was intended. Over a few months, contextual inquiry, interviews, focus groups and surveys produced some key insights. Tragedy of the commons was in full force. Nobody felt responsibility for the place, partly because their use of the space seldom lasted more than a year and a half and partly because they already were responsible for maintaining their home kitchen, and couldn’t muster more kitchen care. The space was already so dingy and dirty, that no one felt it was worth investing time in maintaining it. A negatively reenforcing loop was at play in which the dirtier and more disorganized the space, the less time people wanted to invest in maintaining it, the more dirty and more disorganized it got. There was a particular problem with dirty dishes piling in the sink, and clean dishes piling in the drainer. A perpetual lack of forks was also a frequent frustration. The space had been built/altered over time by whomever was motivated with whatever materials were on hand. The space had never been planned, meaning that layout, materials and tooling were all misaligned with the stakeholders needs. Additionally, there was an extensive collection of stuff in the kitchen that had no clear origin, owner or function. An early fork retention attempt. Having already tried the color coding system seen above, I thought utensils perhaps should be linked to the kitchen in a more concrete way. Forks and spoons were outfitted with a long elastic leash and tethered to a very heavy cement anchor. The leashes were long enough to eat your lunch and wash up, but not long enough for the fork to be removed from the kitchen. It was never meant as a practical solution, but rather as way of drawing attention to the fork problem, and gauging the boundaries of user participation. This prototype made everybody really mad. So many eye rolls. Most people gave up on eating lunch in the building and instead went to the cafe around the corner. Interestingly, nobody tried untying a utensil from the elastic. Next, I tried a system in which the forks weren’t tethered materially, but rather tethered by friendship. Awwwwwww. Each fork was shared by two people. This was a hit, people were enamored of the system and we lost only one fork over the two-week trial period. To address the dishes-in-the-sink issue, I created a structure out of duct tape and corrugated plastic that modified all horizontal surfaces such that they were sloped. If you tried to abandon a dish on the sideboard, it would slide off the side of the sink. It worked surprisingly well, abandoned dishes were severely reduced, but again I think that was mostly due to the fact that this contraption created a physical reminder to folks to wash up. The financial constraints of this project prevented me from fabricating a new sink with angled sides and no bottom as seen in my brainstorm. The prototypes underlined that systems in which a particular use is encouraged, as opposed to discouraging the opposite use, are received better and are more effective. For example, tethering forks to an anchor drew great ire while a system in which users were accountable to their fork buddy was enthusiastically embraced and highly effective at keeping forks in the building. In its final iteration, the fork buddy system included both a fork and a spoon, shared by two students. One first year, and one second year to encourage cross-cohort collaboration. If your fork wasn’t on its hook, chances are your buddy accidentally put it in their backpack-go chat to them about it! Mutual accountability kept forks in the building and cultivated a nerdy love of forks and fork buddies within the community. As for the dish quagmire……I got rid of both the dish drainer and the dish storage shelves, replacing the two with one system - a perforated set of shelves that served both as dish drainer and as dish storage, thus eliminating dish-related bottlenecks. Shelves were fabricated at a width to match the diameter of a cup or bowl, so that each type of crockery had a prescribed place. Before I installed these new systems, I overhauled the space to address the general dinginess, layout issues and tooling problems. I started with a deep clean of the space as well as a purge of extraneous/unused items and unnecessary storage. I added electrical so that the toaster and the kettle could run at the same time, I rebuilt a wall that was previously constructed with plastic sheeting. I drywalled, I painted, I repainted the cupboards. Use-specific storage such as hooks for pans above the stove was added along with personalized student storage such as food bins in the newly open cupboard space. I moved the tea and coffee station to another area to improve traffic flow. 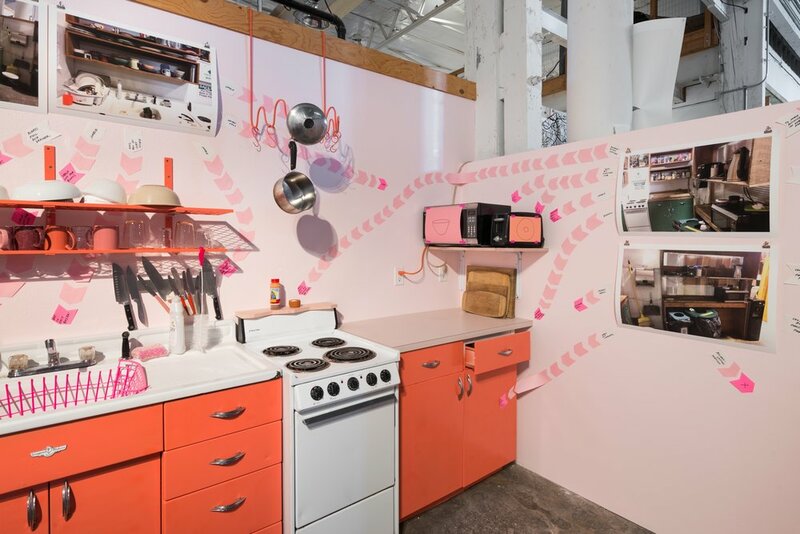 By giving the space a fresh start, simplifying systems of use and prompting critical thinking about use among users, I was able transform what had been a negatively reinforcing loop of kitchen neglect into a positively reenforcing loop of kitchen care. This reversal was evidenced by increased use of the kitchen, enthusiastic feedback from the community, and the fact that the second years updated fork buddies to include the incoming cohort. For this project, I received my graduate program’s highest honor, the AC+D Fellowship. I struggled with how prescriptive to be in my approach. A huge insight was that systems in which a particular use is encouraged, as opposed to discouraging the opposite use, are received better and are more effective. My approach was highly interdisciplinary and largely unconventional. I think this lent richness, ambition and nuance to my approach, but also resulted in a project less focused and less specific than I would have liked. Additionally, I was ignorant to service design as a field and had limited knowledge of language and protocol used in related fields. Frameworks from these fields likely would have helped me organize my approach. But may have also been limiting…..? I got obsessed with pink. I had good reason for choosing the colors I did, but given the chance, I might make some changes. Where there’s a May there’s a way.